It has been reported that a 19-year old driver in Perth was issued with an infringement notice for $300 and three demerit points after allegedly driving while eating a bowl of breakfast cereal. The incident has triggered discussion about whether and, if so, in what circumstances it may be an offence to eat food or drink beverages whilst driving a motor vehicle. Here’s a rundown of the law. There is currently no law in any Australian jurisdiction against eating food or drinking non-alcoholic beverages while driving. However, police may issue an infringement notice, or even a Court Attendance Notice, if they reasonably suspect a vehicle was being driven negligently – whether as a result of being distracted by eating, drinking or otherwise. Negligent driving is an offence under section 117(1) of the Road Transport Act 2013 (NSW) which simply states the a “person must not drive a motor vehicle on a road negligently”. A penalty notice for this offence comes with a $448 fine and three demerit points. However, the maximum penalty increases to $1,100 if the matter is dealt with in court, which can occur if police choose to issue a court attendance notice rather than a ticket, or the driver elects to take the matter to court. In that event, the court has discretion to impose a 12-month disqualification from driving, although it is not required to do so. The maximum penalty for this offence is nine months’ imprisonment and/or a fine of $2,200 if it is the driver’s first major traffic offence within the past five years. The offence also carries an “automatic” disqualification from driving of three years, which can be reduced by the magistrate to 12 months. If it is a driver’s second or more major traffic offence in five years, the maximum penalties increase to 12 months in prison and/or a $3,300 fine, and the automatic disqualification is five years which can be reduced to a minimum of two years. Grievous bodily harm has been defined by the courts as “really serious harm”; DPP v Smith AC 290; Haoui v R (2008) 188 A Crim R 331. The maximum penalty for where this is the first major traffic offence in five years is 18 months’ imprisonment and/or a fine of $3,300, plus three years off the road which can be reduced by a court to a minimum of 12 months. If it is a second or subsequent offence, the maximums are two years in prison and/or a $5,500 fine, and a disqualification of five years which can be reduced to two. What is the definition of “drive”? This is known as an “objective test” which looks at what a reasonable and practicable driver would have done in the given situation. It requires an assessment of all relevant circumstances known to the driver or rider at the time, rather than a determination as to what, given the benefit of hindsight, would have been the best course of action. Driving in the absence of “due care and attention” can amount to negligent driving, provided the act was caused by inattention that was deliberate or arose from an error of judgment; Sprigg v Police SASC 10. So, a deliberate act of eating, drinking or engaging in other conduct while driving can amount to the offence of negligent driving – whether or not an accident occurs – if it causes the driver not to pay due care and attention to the road. 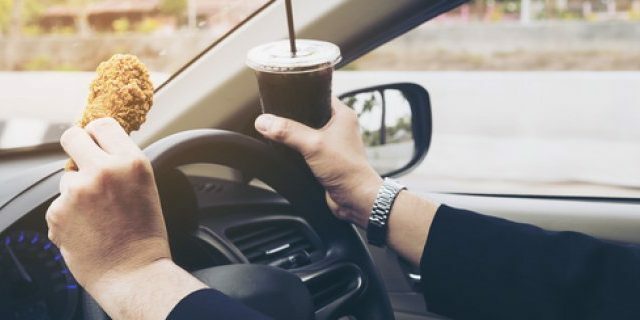 Applying this test to practical situations, it may be the case that trying to eat a meal using utensils could amount to negligent driving, whereas simply sipping on a cup of coffee would be unlikely, by itself, to establish the offence. By the same token, trying to read a book or fill out forms may lead to the offence being established, while momentarily checking the radio normally would not. There is no list of which activities amount to negligence and which do not; it is a matter of fact determined by considering all of the circumstances of any given case. Can I drink alcohol while driving? Drinking alcohol while using a motor vehicle has been an offence in New South Wales for over a decade. The prohibition is contained in regulation 298-1 of the NSW Road Rules 2014, which states that a “driver must not consume alcohol while driving”. A penalty notice for the offence comes with a fine of $337 and three demerit points. The maximum fine is $2,200 if the matter is dealt with in court.